Station at the Church of St. Praxedes. This is the church where the precious Pillar of Flagellation was brought from the Holy Land by the Crusaders along with three thorns from the Crown of Thorns. Under Pope Paschalis I many relics of numerous martyrs were brought to this church. In the Epistle Isaias, typifying Jesus, prophesices His obedience and the indignities of His Passion. He likewise foretells His triumph, for He has placed His trust in God, Who will raise Him to life again. Finally he shows how the Jews were to be confounded. Then the Gentiles through Baptism, the public penitents by being reconciled and the faithful by their Easter Confession and Holy Communion will pass from darkness to the light of which Jesus is the fount. The choice of the Gospel is not without connection with that of the Stational church for St. Praexedes and St. Pudentiana put their house at the disposal of Pope St. Pius I, like Mary and Martha received Jesus into theirs. Until Maunday Thursday, in masses of the season, the Psalm Judica me Psalm 42 is omitted as well as the Gloria Patri after the Introit and the Lavabo. Grant, we beseech Thee, almighty God, that we who ail through infirmity in our many difficulties, may be relieved through the merits of the passion of Thine only-begotten Son. Who with Thee livest and reignest in the unity of the Holy Ghost, one God Forever and ever. R. Amen. We beseech Thee, O Lord, mercifully to receive the prayers of Thy Church : that, all adversity and error being destroyed, she may serve Thee in security and freedom. Through our Lord Jesus Christ, Who livest and reignest, with God the Father, in the unity of the Holy Ghost, one God For ever and ever. R. Amen. The Lord God hath opened my ear, and I do not resist: I have not gone back. I have given my body to the strikers, and my cheeks to them that plucked them: I have not turned away my face from them that rebuked me, and spit upon me. The Lord God is my helper, therefore am I not confounded: therefore have I set my face as a most hard rock, and I know that I shall not be confounded. He is near that justifieth me, who will contend with me? let us stand together, who is my adversary? let him come near to me. Behold the Lord God is my helper: who is he that shall condemn me? Lo, they shall all be destroyed as a garment, the moth shall eat them up. Who is there among you that feareth the Lord, that heareth the voice of his servant, that hath walked in darkness, and hath no light? let him hope in the name of the Lord, and lean upon his God. Arise, and be attentive to my judgment: to my cause, my God, and my Lord. V. Bring out the sword, and shut up the way against them that persecute me: say to my soul: I am thy salvation. Jesus therefore, six days before the pasch, came to Bethania, where Lazarus had been dead, whom Jesus raised to life. And they made Him a supper there: and Martha served. But Lazarus was one of them that were at table with him. 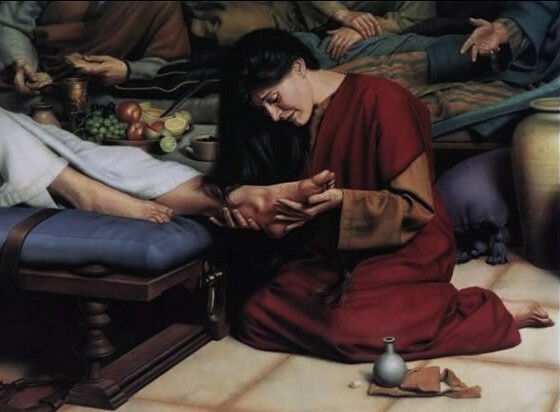 Mary therefore took a pound of ointment of right spikenard, of great price, and anointed the feet of Jesus and wiped His feet with her hair. And the house was filled with the odor of the ointment. Then one of His disciples, Judas Iscariot, he that was about to betray Him, said: “Why was not this ointment sold for three hundred pence and given to the poor?” Now he said this not because he cared for the poor; but because he was a thief and, having the purse, carried the things that were put therein. Jesus therefore said: “Let her alone, that she may keep it against the day of My burial. For the poor you have always with you: but Me you have not always.” A great multitude therefore of the Jews knew that He was there; and they came, not for Jesus’ sake only, but that they might see Lazarus, whom He had raised from the dead. Deliver me from my enemies, O Lord : to Thee have I fled, teach me to do Thy will, for Thou art my God. Grant, O almighty God, that being purified by the powerful virtue of these sacrifices, we may comes with greater purity to their divine source. Through our Lord Jesus Christ Thy Son. Who liveth and reigneth with Thee in the unity of the Holy Ghost, one God Forever and ever. R.Amen. Protect us, we beseech Thee, O Lord, who assist at Thy mysteries, that holding fast to things divine, we may serve Thee both in body and soul. Through our Lord Jesus Christ, Who livest and reignest, with God the Father, in the unity of the Holy Ghost, one God For ever and ever. R. Amen. Let them blush: and be ashamed together, who rejoice at my evils. Let them be clothed with confusion and shame, who speak great things against me. May Thy holy mysteries, O Lord, inspire us with divine fervor, that we may both delight in their celebration and in their fruit. Through our Lord Jesus Christ, Who livest and reignest, with God the Father, in the unity of the Holy Ghost, one God For ever and ever. R. Amen. We beseech Thee, O Lord our God, that Thou wouldst not suffer to be exposed to human dangers those to whom Thou givest to rejoice in this divine banquet. Through our Lord Jesus Christ, Who livest and reignest, with God the Father, in the unity of the Holy Ghost, one God For ever and ever. R. Amen. Help us, O God of our salvation, and grant that we may celebrate with joy the memory of those mercies whereby Thou hast graciously restored us to a new life. Through our Lord Jesus Christ, Who livest and reignest, with God the Father, in the unity of the Holy Ghost, one God For ever and ever. R. Amen.